Other Services - De website van embacr-nl! For this procedure it is essential to obtain the international birth or death certificate emitted by the respective local Authority, duly apostilled by the Ministry of Foreign Affairs of The Netherlands. Once the document has been apostilled, the interested party must present it before the Consulate along with his identity card; in order to fill out a form that will be provided by the Consul (an appointment is necessary for this procedure). For this procedure it is essential to obtain a marriage certificate emitted by the respective local authority, duly apostilled by the Ministry of Foreign Affairs of The Netherlands. Once the document has been apostilled, both spouses must present it before the Consulate, along with their identity cards; in order to fill out and sign a form that will be provided by the Consul (an appointment is necessary for this procedure). Note: The marriage certificate must be officially translated to Spanish, for its use in Costa Rica. This procedure can be done through the services of official translators in The Netherlands. On this website you will find official translators. Apostille is certificate which verifies and confirms the seal and signature of person who authenticated the document . Some people call this 'superlegalisation'. There are designated authorities in every country to issue apostille certificates or legalisation. Apostilles are commonly issued for various documents related to adoption cases, for commercial documents, for official documents related to vital statistics, and for court records, land records, school documents and patent applications. Who had signed 'hague agreement for abolishing the need for public documents' can issue apostille. Once an apostille is obtained, it is automatically considered 'valid' and 'acceptable' in all the 98 hague convention countries. Some small territories or notably some countries, very well recognise apostille, eventhough they cannot issue apostille. See: Hague Convention Website. If the country where the document will be used is not a party to the Convention, you will have to begin the legalization process. In the Netherlands apostilles can be requested at the regional court house ("Arrondissements rechtbank"). Select the court house which belongs to the region in which the certificate (birth, death, marriage) or other official document was issued (e.g. divorce decree, notary document). There is a walk in service or mail in service. Foreign elections for Costa Rican nationals). Information on the import of domestic animals (pets) into Costa Rica. Certificates for Dutch naturalization of Costa Ricans (marriage customs, use of two last names, consular registry). Authorizations for the exit of minors from Costa Rica. 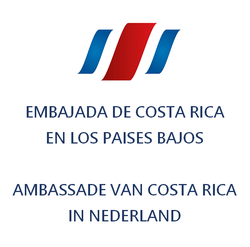 Registry of Costa Ricans in the Consulate (All Costa Rican national must complete the Padrón Consular. Please see here. Fees for consular services are determined by the Consular Fees Decree.